Right from the start, I knew there was something wrong with the windshield washer fluid system. It weakly burped a little fluid onto the lower windshield, which promptly smeared and froze all over. I was lucky to have only a few hours of cold, dry snow on the road trip, which didn’t stick to the windshield. I assumed the pump was probably shot but should have considered there could have been a blockage in the tubes and metal jets. 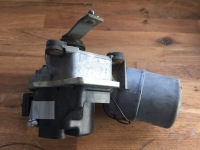 I pulled the assembly off the firewall and was surprised to realize it was also the windshield wiper motor and was still attached to the windshield wipers of course. I detached that and cleaned the entire unit. I removed the windshield fluid reservoir, cleaned it (black gunk in the bottom that was likely part of the problem) and most importantly I tried to blow through the metal jets and found them partially blocked. They were clearly corroded on the outside, and so likely on the inside, too. Not having any CLR or acid, I got some vinegar, mixed it about 50/50 with water and let the jets and rubber hoses soak in it for three days. They came out noticeably cleaner. I reinstalled everything and filled the reservoir with clean fluid. The windshield cleaning now works as it should, squirting fluid across the windshield from top to bottom. Replacement windshield wiper blades turn out to be one of the more difficult things to source. Many places online will state they have blades that will fit, but they turn out not to. The original blade units are 'pin mount' and there's just no way the new plastic hooks and pins will fit properly. I finally sourced new blades from Classic Performance in Calgary, at a hefty $29.95 each. Although I got the manufacturer's recommended length, they look 'short' and don't seem to cover as much of the windshield as might be possible. I think next time I replace them, I will go for an inch or two longer.